Halo 3, one of the most anticipated videogames for the Xbox 360, will be released to the public in test, or beta, from 16 May. The online multiplayer element of the game will be made available to the public with feedback going to developers Bungie. 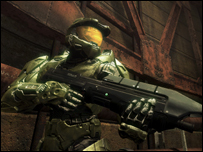 More than 14.7m copies of Halo titles have been sold and more than 800m hours of online Halo games have been played. The beta will last for three weeks and ends on 7 June. Three multiplayer maps will be available - Snowbound, High Ground and Valhalla. Halo 3 is expected to be released in the last quarter of 2007 and is a key weapon for Microsoft in its rivalry with Sony and Nintendo. The game has become an important franchise for Microsoft and has evolved into an industry which encompasses action figures, graphics novels, books and clothes. On the website of Halo creators Bungie, content manager Frank O'Connor said the beta would contain "quirks, a couple of roughedges". He added: "A lot of secret features are hidden in this beta. We're keeping a lot of our powder dry for Fall."